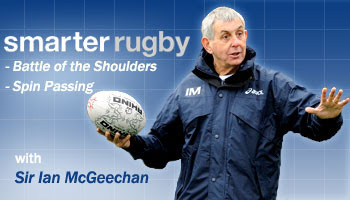 this is just so bad, mcgeechan is a terrible coach. What is the target audience of these videos? I guess I ask because I'm not sure what other kind of passing they'd be learning. What's "bad" about it Anon? He seems like an excellent coach - this series is obviously based on getting the very basics right, which he is doing. I'm guessing the drills are aimed at beginners. its the fact that its aimed at complete beginners that annoys me, theres nothing here that an u-9s/10s/12s coach wouldnt be able to teach. mcgeechan isnt doing anything particularly brilliant here or anything. I think he also gives a terrible team talk before games, lions v s.africa not this year but the last time they visited was pretty embaraasing to listen to. Guys, we've all played with players who simply can't get the concept of running onto the ball. They either time their runs wrong, or if you're the receiver they try to bullet it into your chest, rather than floating/bulleting it out front for you to truly hit it at pace. Yes it's fairly basic, yes it's logical, but believe me, some players need reminding of this type of thing. I also thought the clearing at the ruck bit, with getting your shoulders below the other players, is a pretty handy and simple method to keep in mind, rather than just saying to yourself 'Lets clear that motha effer out of there!!'.. then getting tossed on your arse. The whole point of this is 'SMARTER RUGBY' now if you cant get the basics right then you arent gonna get much else right..
Firstly, Sir Ian is obviously a high caliber, succesful coach and very well respected. I think the main aim of these videos is to plaster "asics" everywhere possible and get some nice publicity for them with Geech as the star - as opposed to technical coaching aspects of the game. The intention is pretty good though. Would have been nice to see his take on alternative rucking techniques though, based on who you're up against - getting your head under theirs/ the judo roll etc. you're a bunch of know it all wankers!!! Hahaha why aren't any of you guys coaches of international representative sides? dickheads! I feel sorry for the guys getting coached though. Bet when they signed up for a days coaching off Sir Ian McGeecan they'd be learning a few more advanced skills. All the skills are relevant though and playing good rugby is all about doing the basics right at 100mph. I believe presenting a target by putting your hands up to meet the ball makes a world of difference. So many times you see the passer passes towards the receivers hips or inside shoulder even and you loose that momentum. It's amazing how so often , even in international rugby a poor pass stops a try and by poor I mean not in front of the player and straight to the receivers hands. Ian has got it right. When coaching a team you get the basics perfected then once that is sorted things can only improve.